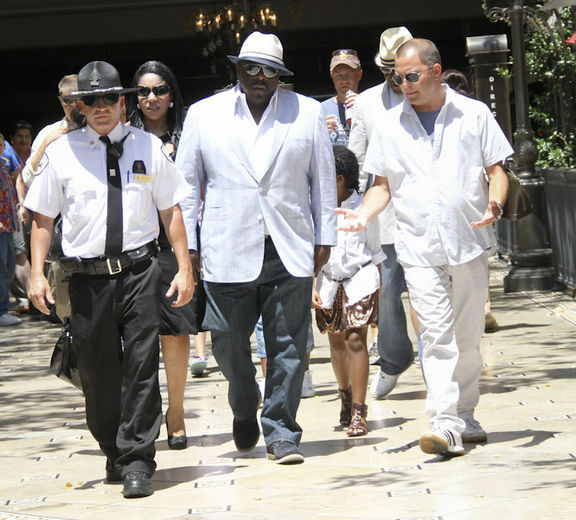 Cedric the Entertainer was spotted walking through the Grove in Los Angeles yesterday, I know your going shopping and all and have money or cards on you, but is the security really needed like that, last I knew people wasn,t checking for you like that. IDK he looks great though. Keri Hilson in NYC walking in the rain, apparently Keri made a very silly statement about recently deceased singer Amy Winehouse on her twitter page, saying "she hopes she finds a happier place than her self destructive state" and wants her to resurrect to party with her. Ok Keri we know Amy was on the down slope and all but the girl is dead show some respect cause your career is not guaranteed neither is your life. Anyway most of Amy's fans already got at Keri, so I'll leave her alone.